He rubbished projections that the upcoming election in the Darjeeling Lok Sabha seat would be a fight between two factions of the GJM, one led by him which is supporting BJP candidate Raju Bista and the Binay Tamang faction which is supporting TMC candidate Amar Rai.Polling for Darjeeling Lok Sabha seat will be held on April 18. "We have a saying in Nepali - 'bahira rumaley, bhitra undruk umale'y - those who cannot feed themselves are talking about organising picnic for others," Gurung said to explain his point. Asked to comment on Chief Minister Mamata Banerjee's oft repeated claims that the 'Hills were smiling' and peace and development have seen a new dimension in the area, the GJM leader, who once had shared a cordial relationship with the TMC supremo, said the smile was only "mockery and scorn". "Peace in the hills today is akin to the peace of the graveyard. In fact corruption, intimidation, threats, curtailing of democratic and constitutional rights and making a mockery of the judicial system has increased in Darjeeling than in rest of the state. 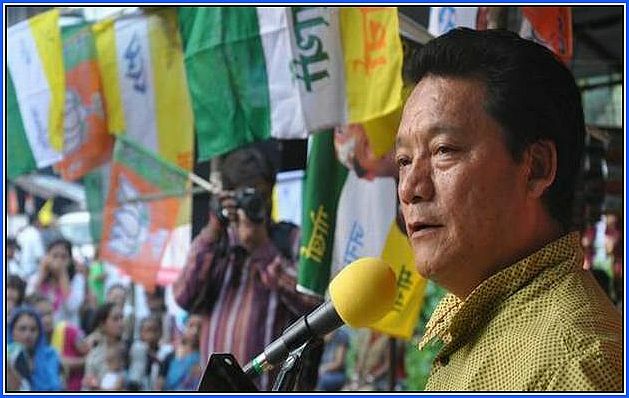 What has developed in Darjeeling is the suppression and oppression of peoples' sentiments," Gurung alleged. It is not only the electorate in Darjeeling, but also of neighbouring Alipurduar, Cooch Behar and Jalpaiguri Lok Sabha constituencies who are against the ruling TMC, he alleged. Exuding confidence that Bista would win from Darjeeling LS seat, Gurung derided the Tamang faction, calling it 'Trinamool Congress Binoy Team' and said it is not GJM. He said Bista with his background in management and experience would be able to generate the national consensus needed for the separate state of Gorkhaland. On joining hands with long-time political rival Gorkha National Liberation Front for the parliamentary elections, Gurung said the alliance "was strongly desired by the people in the region". "We had been receiving requests and suggestions from our cadres and general public that our two parties must join hands and work together. We joined hands as we realised that no one can defeat us if we are united," he said. Exuding confidence that "our candidate will win with a convincing margin," he asserted, "I am still the GJM president." Asked about his plans to campaign from hiding, Gurung said, "I don't need to campaign in person. The people here are emotionally connected with me because I have not sold out. Nor have I given up on our collective aspirations. "Over 70 per cent of the people in the region still support me and what we stand for. This is the West Bengal government's internal report. Our election slogan is simple "Ballot for Bullet". Criticising the state government for its "rampant abuse" of police machinery and other administrative offices, he said the faction headed by him will be asking for votes against "oppression and suppression" of democratic and constitutional rights.